When you’re on the go, you know how important it is to get the info you need on your shipments as quickly as possible. Carriers and clients have counted on us for up-to-date PAPS and PARS tracking information for years – and now we’ve put the power of these trackers in your pocket. 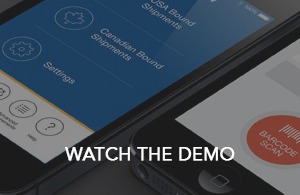 The Livingston Shipment Tracker App lets you quickly and easily check the clearance status of your shipments through the U.S. and Canadian borders on the go, keeping you informed of your shipment’s status no matter where you are. Our SpeedScanner functionality makes it easy to check shipment status with a simple barcode scan. No more typing in long barcodes – just scan and go! Even if your shipment doesn’t have a bar code, checking shipment status has never been easier. Rather than dialling a number and talking to a dispatcher, just log in, key in your information and find your shipment status. For border entries into Canada (PARS tracker), you can register and use the “set and forget” functionality to get shipment alerts with the click of a button. You can receive SMS and/or e-mail updates for your shipments for even more speed and convenience. Download the Livingston Shipment Tracker App today and simplify your life at the border.